The impact of Ohio State University football coach Woody Hayes extended beyond the sport he loved. Besides leading the school's football team, he also taught and mentored students in academics and physical education. One of his students was named Bobby Knight. As sports fans know, Knight would go on to become a legendary coach himself, leading the Indian Hoosiers to three NCAA championships. Both Hayes and Knight were known for competitive natures combined with volatile tempers. But passion and emotion are part of what separate the legendary from the ordinary. These labels feature quotations from Woody Hayes as well as a convenient self-adhesive backing. 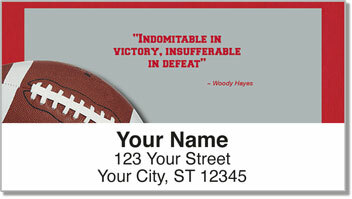 Get your own Woody Hayes Address Labels today. Order matching checks to make it complete!